The eye is a very complex organ. It has a lens at the front which focuses light on to a light sensitive tissue that lines the inside of the back of the eye – this tissue is called the retina. The retina converts the light rays into impulses and these are sent through the optic nerve to the brain, where they are recognised as images. 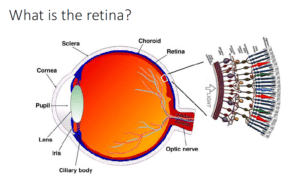 The retina is composed of light sensitive cells known as rods and cones. The human eye contains about 125 million rods, which are necessary for seeing in dim light, and six to seven million cones, which are essential for receiving a sharp accurate image and for distinguishing colours. First rod cells and then cone cells gradually deteriorate and are lost in retinal dystrophies.